Sometimes when I’m writing I have no idea when inspiration will strike. Remember my awesome TV pitch, President Hobo? That would make ABC millions! If only they answer my phone calls. And my movie treatment for Hamsterus! would have made DreamWorks a fortune, if it wasn’t for that restraining order Spielberg put on me. Well I’ve done it again. There I was, wasting time on some stupid Hollywood Russell story and I realized what an idiot I was. Some guy from the last century named Hollywood? C’mon, his big claim to fame is that he wears a trench coat. Big deal, so did Winston Churchill at the Yalta Conference. Big whoop. I’ve been wasting my time. The public doesn’t want some old mystery dude, they want something new, something modern. I haven’t really figured out what a Murderchimp is, but trust me, this is the next BIG THING! I’m so sure it’ll be big that I’ve already written the back cover blurbs to what I know is going to be my bestselling idea. And it may not even be a book! I have no idea, but this has to be good, I can feel it! MURDERCHIMP is the international assassin for hire. He works only for the highest bidders of the highest bidders who can bid even higher! MURDERCHIMP is the high-flying, tuxedo-wearing, blood-letting, roller-skate traveling, internationally known assassin loved by women the world over and feared by men the world over! MURDERCHIMP can scale walls, climb trees, eat bananas, and make love in 347 different positions! MURDERCHIMP! 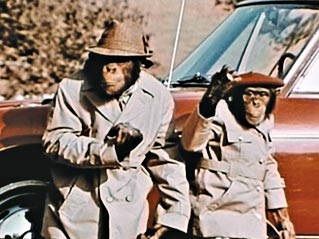 The only chimp/assassin/jet-setter/Blaxploitation hero you’ll ever need! MURDERCHIMP! Is always capitalized and never marginalized! This is going to be awesome! So what if Jack Klugman is dead, he’d LOVE MURDERCHIMP! So whatever MURDERCHIMP turns out to be- a book, bedsheets, contraceptive, whatever- rush out and buy seven or eight! Trust me, you’ll love it, and I’ll love the cash! I’m behind you 1000% and want the franchise on the McDonalds Happy Meal toys! Happy Meal toys, senior citizen walkers, whatever it turns out to be!